Added a width to the map, so that we can get better sizing of the SRTM data. Take the filename of an SRTM file to figure out the proper width. Doubled the size of the PDF renderings in hopes of improving the image quality. Not sure if it is helping. Integrated relief shading with the elevation colouring. Makes a much nicer picture, especially with real world data. Changed the Sea Level window to be an elevation window and include a histogram of elevations. 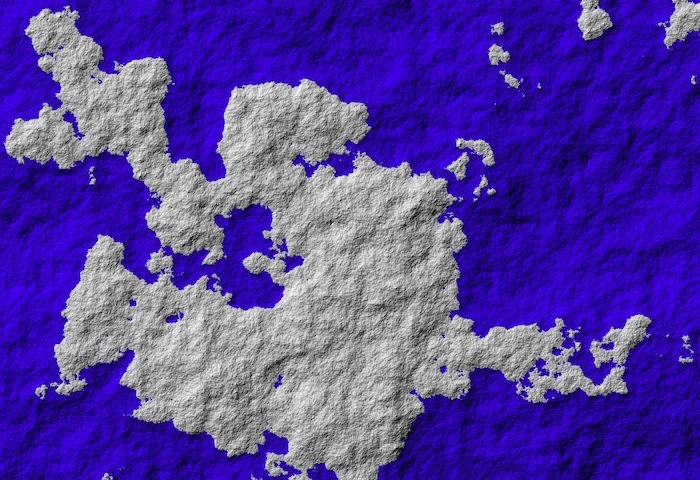 This is the first version to add support for real world data, as opposed to just random fractals. This is hilighting areas that need to be changed in the future. Added the Elevation Colour window to allow users to choose the colours that the map shows up in. Added the ability to read HGT files from the Shuttle Radar Topography Mission. Removed the vertical exaggeration from relief views so real world data looks better. Fractal relief data looks much fainter now. Sorry. Changed the file format to remove an internal spelling mistake that no one would likely ever see. We're using the Queen's English now. Better error handling when opening files. If the elevation is at sea level, it is treated as being in the water. Small change, but otherwise the HGT files look horrible. Since I incorrectly made the link to the last version, no one has downloaded it. I feel fine changing the file format. If the water panel is set to "No Water", the sea level controls are disabled. Topographic views for land are now in colour. Changed file format to include a scale. It is used for the relief display. First available version. Support for creating complete maps on cylinders, flatlands or spheres. Topographic and relief viewing options. Sea level can be changed. Technically, I've been playing around with this program since 1994 when I wrote the first version in Pascal. It was a good learning experience. I've only ever started releasing versions in 2010 when it started to look professional enough not to be embarrassing.